L’année 2015 est également magnifique dans le Sud: elle se caractérise par d’excellentes conditions sanitaires grâce à un hiver doux et humide, suivi d’un printemps plutôt chaud et sec. La vigne a bien supporté les fortes chaleurs et la sécheresse de l'été grâce à de bonnes réserves hydriques. Après une floraison satisfaisante, les pluies du mois d'août ont favorisé une maturation rapide et régulière, avec des raisins à la teneur élevée en composés phénoliques et anthocyanes. Comme dans le Nord, les vendanges se sont déroulées dans des conditions optimales. D’un beau rouge carmin intense, Beaucastel 2015 présente une attaque vive puis révèle très rapidement des arômes de beaux fruits rouges. La finale est délicatement réglissée, avec des tanins puissants, mais pas agressifs. Un grand millésime de Beaucastel Rouge. This knockout wine utilizes all 13 varietals that are allowed in Châteauneuf-du-Pape. It has a stunning nose of green peppercorn, blackberry jam, herbs de provence, with bacon fat. The wet stone element comes on after roughly an hour decant. Firm and focused, the wine delivers delicious blackberry cordial, black olive tapenade, Umami and crushed wet stone flavors. The combination of weight and tension here makes this wine simply irresistible. 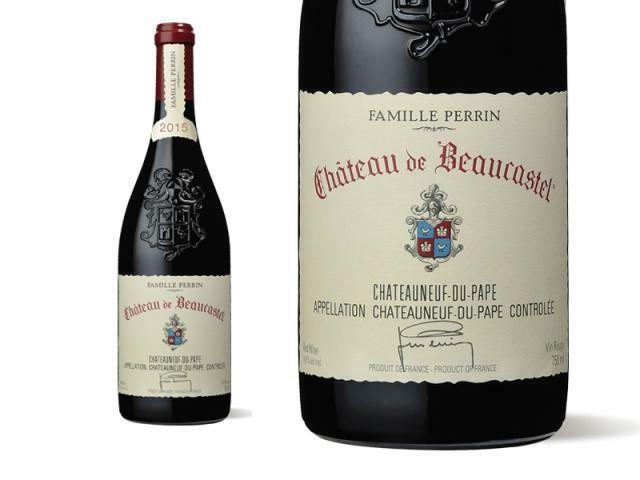 The 2015 Châteauneuf-du-Pape checks in as a blend of 30% each of Mourvèdre and Grenache, 10% Syrah, 10% Counoise and the rest a mix of permitted varieties, and they’re more and more keeping the stems with Syrah component. This is a beauty that offers more depth and richness than just about every other wine in the vintage. Blackberry, black raspberries, garrigue, spice and hints of saddle leather all flow to a full-bodied, rich, layered 2015 that has a stacked, concentrated mid-palate, ripe, sweet tannin and an undeniable opulence that’s missing from too many 2015s. Marc Perrin compared this cuvée to 2001, and I can’t disagree with him. Drink this blockbuster beauty anytime over the coming two decades. A stunner from the get-go, with waves of thoroughly seductive boysenberry, plum, blueberry and raspberry reduction forming the core, while roasted apple wood, rooibos tea, bergamot, and anise notes flash throughout. Has plenty of bass, with a Turkish coffee accent and a hint of alder driving underneath. Everything moves in lockstep through the seriously long finish. Best from 2020 through 2045. From France. Peppery fruits here from start to finish. On the palate, the wine is rich and full bodied, with real depth of flavor. Balanced, concentrated and long, the freshness in the fruits with their layers of flavor, interspersed with wild herbs works. The sweet, ripe, cherry and plummy fruits seem to go on and on. There is a richness and almost exotic character in the texture this year that is a complete turn on. This will age quite nicely. All 13 grapes. This has a dark fruited, blueberry and blue plum nose with wide swinging tannins. Some white peppery elements, violets, brooding dark spices, blue fruits and dark plums. Builds from the ground up. Dark stones. Impressive, powerful wine. Depth and detail on the dark-fruit nose. Stylish, balanced and very persistent, delivers crunchy, spicy fruit. Drink 2020-2044. Brilliant ruby. Spice-accented aromas of ripe red fruits, candied flowers, earth and smoky minerals; a zesty white pepper quality emerges with aeration. Sweet, expansive and energetic on the palate, offering intense raspberry, spicecake and lavender flavors and a subtle touch of smoke. Completely stains the palate and shows outstanding clarity on the strikingly long, focused finish, where smooth tannins make a late appearance.